On the Sunday of the Myrrhbearers, the Church celebrates the memory of all the Saints associated with the city of Thessaloniki. 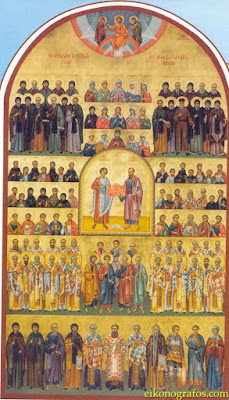 In the detailed icon above of All Saints of Thessaloniki, depicted at the center of all the many Saints is the patron of the city, St. Demetrios, and the enlightener of the city, St. Paul. For studies on the 151 feasts of Saints associated with Thessaloniki, see here. 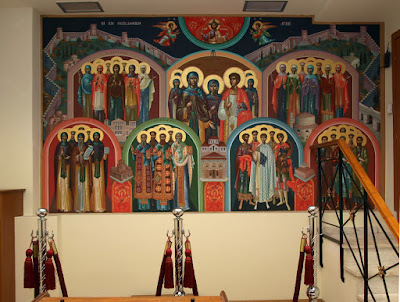 A church dedicated to All the Saints of Thessaloniki is located at the Ecclesiastical Academy of Thessaloniki.